Among the reasons people decide to go through the stressful delightful process of remodeling their kitchens, organization and storage rank next to the top. Wood partitions built into cabinet. 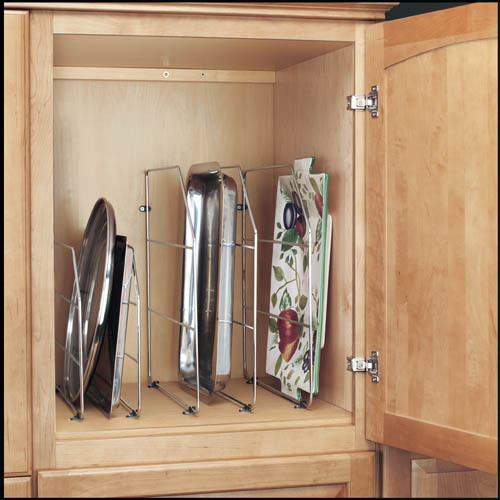 Tray dividers work well in base cabinets, pantry cabinets, and in the deep upper cabinet space above the refrigerator or oven. 2) Roll-out trays. 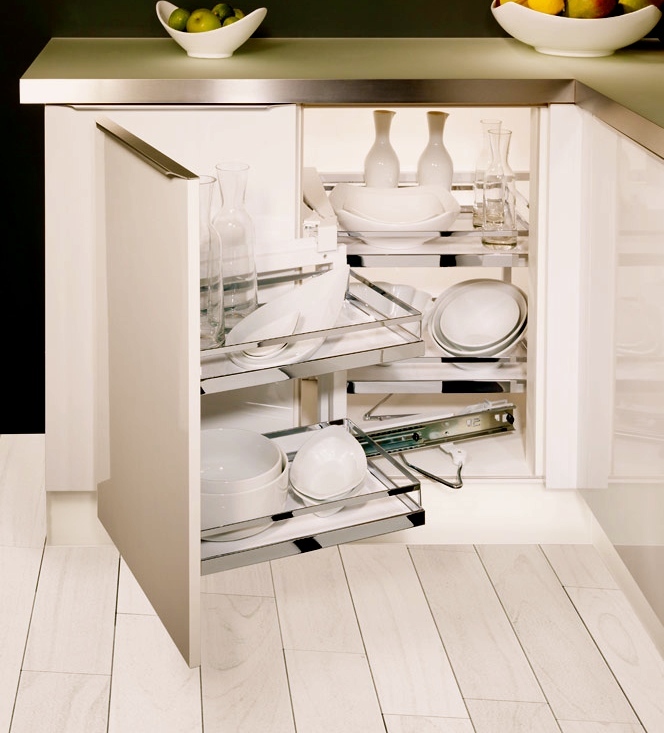 Also called pull-outs, rollout shelves or drawers, or interior drawers. These are shelves with a lip that operate like a drawer, but sit behind a door. Roll-outs allow you to bring what’s inside the cabinet out to meet you, instead of requiring you to climb inside the cabinet (or send your child in there) to get what you need. Trust me, your knees will thank you. They aren’t as efficient as drawers (more on that in a moment) but they work especially well in pantry cabinets, or behind doors where a drawer may not be the best solution. For example, if you need a flexible interior cabinet height to store your blender or stand mixer, a drawer may not be the best solution. But there may be space above or below the needed storage space where a roll-out would help maximize storage. 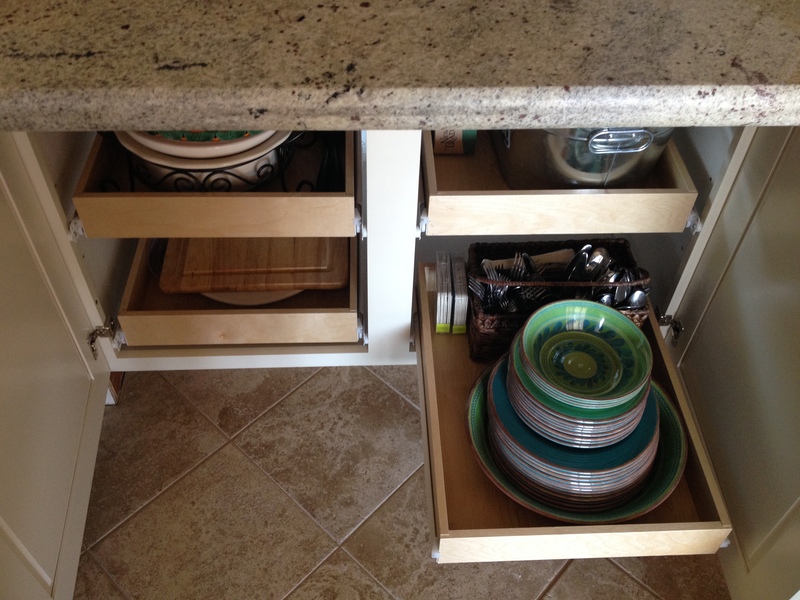 Likewise, drawers wouldn’t make sense below a countertop overhang, but roll-outs can be very handy. 3. Drawers. While drawer banks can increase the cost of your cabinets, they also increase your kitchen’s efficiency. Drawers are basically containers that slide in and out of your cabinets, to capture things that don’t stack well. They only require one movement (open the drawer) to access their contents, versus 2-3 movements to access the same contents stored on a roll-out behind closed doors. 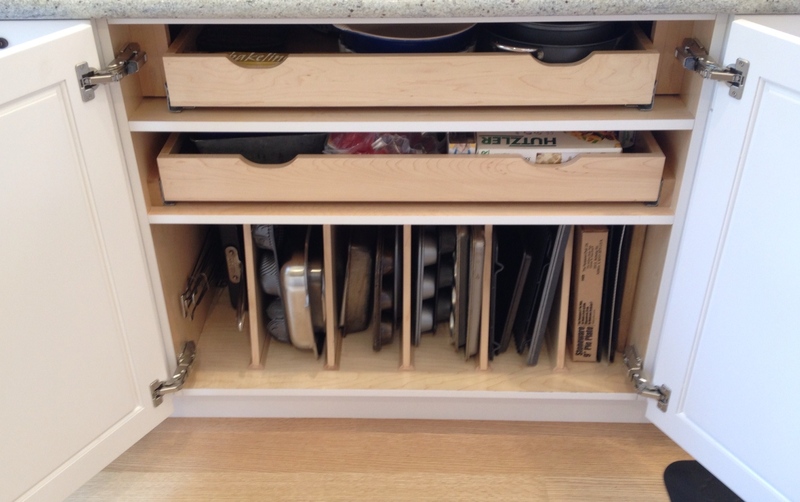 For this reason, my clients tend to prefer drawers over roll-outs for most areas in the kitchen. 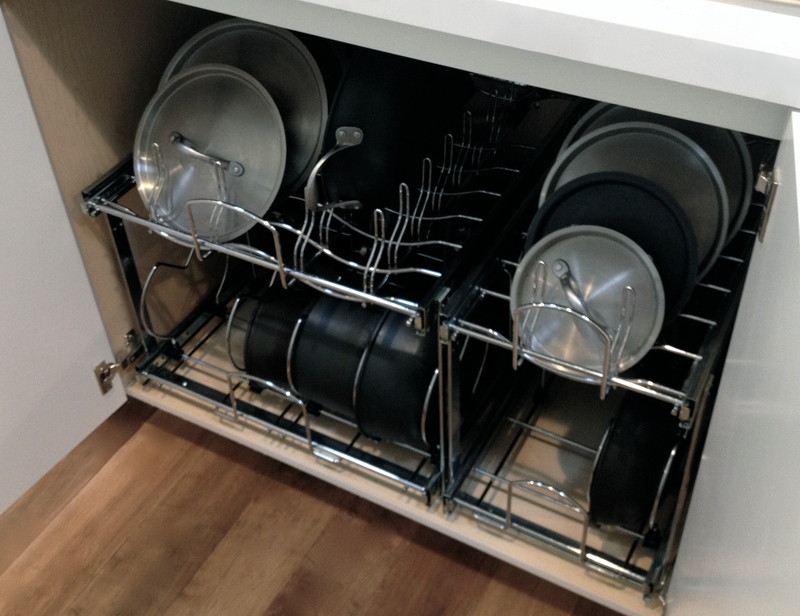 Drawers are also a great way to store dishes for those with back problems, young children, or a lack of upper cabinet space, or who just prefer storing dishes close to counter-height (see number 4 below for a must-have accessory for drawer dish storage!). One thing drawers DON’T work well for are pots and pans. Why? Because I’ve never met a set of pots and pans that get along with one another in a drawer. They don’t nest well, which results in wasted space and difficulty putting them away and getting them out. 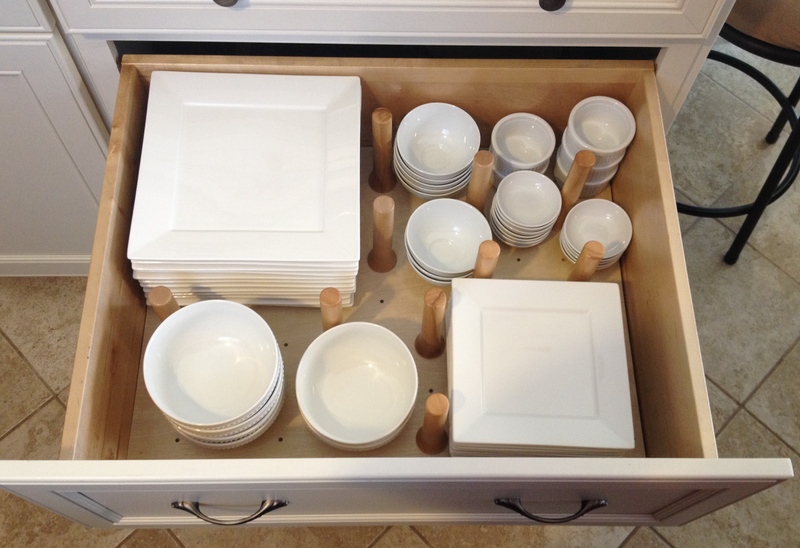 But drawers DO work well for towels, tupperware, gadgets, pot holders, silverware, bowls, etc. 4. Drawer peg storage organizers. These little guys are very handy when it comes to storing plates, bowls, etc inside cabinet drawers, as they stop things from sliding around and keep them neatly stacked. The pegs can be moved anywhere on the pegboard for fully customized storage capability. Keeping dishes in a lower cabinet can be a back-saver, and can also be a way of encouraging little ones to help empty the dishwasher and set the table, because the dishes are within reach. Side note: If the dishes are breakable or too heavy for little ones, I would recommend adding a child safety latch to the drawer until they are old enough to help. 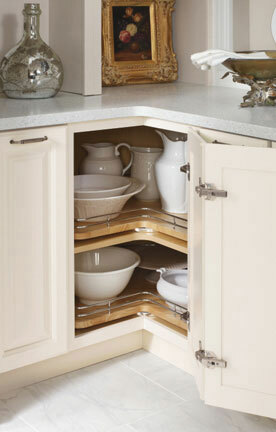 Drawer peg storage dividers make it easy to store dishes in base cabinets instead of lifting them overhead. 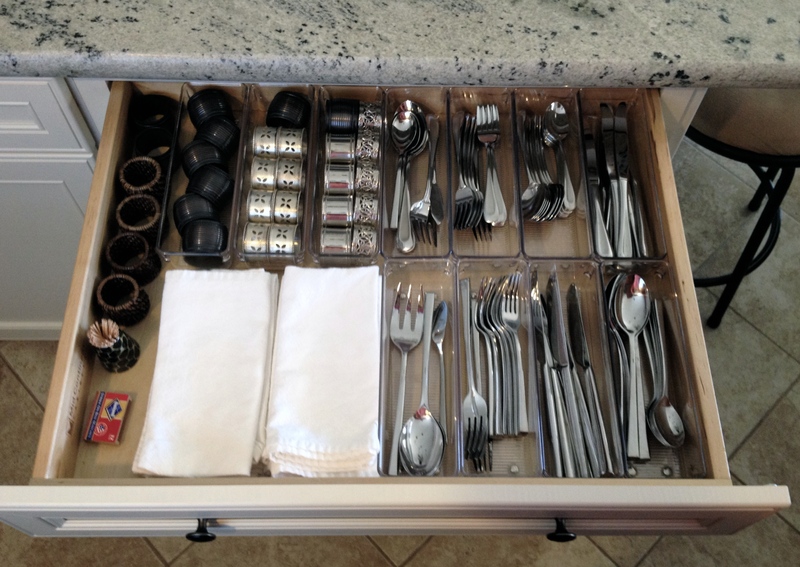 Silverware drawer with acrylic drawer dividers from Bed Bath and Beyond. 6. Pot and pan storage organizer. 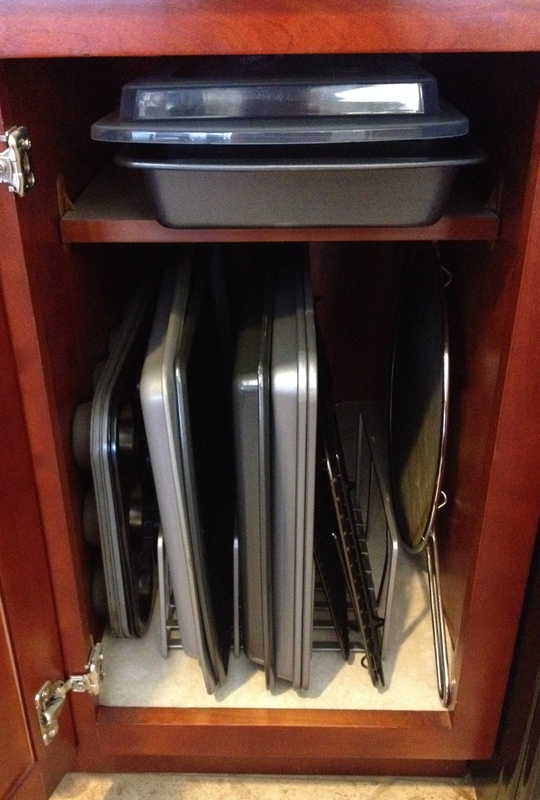 I’m not an advocate of pot & pan drawers because pots and pans (and their lids) don’t tend to nest well, so storing them in a drawer can waste a lot of space. 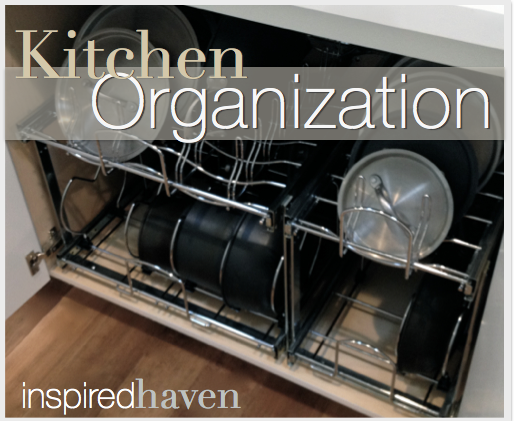 This two-tiered organizer is a great alternate solution. 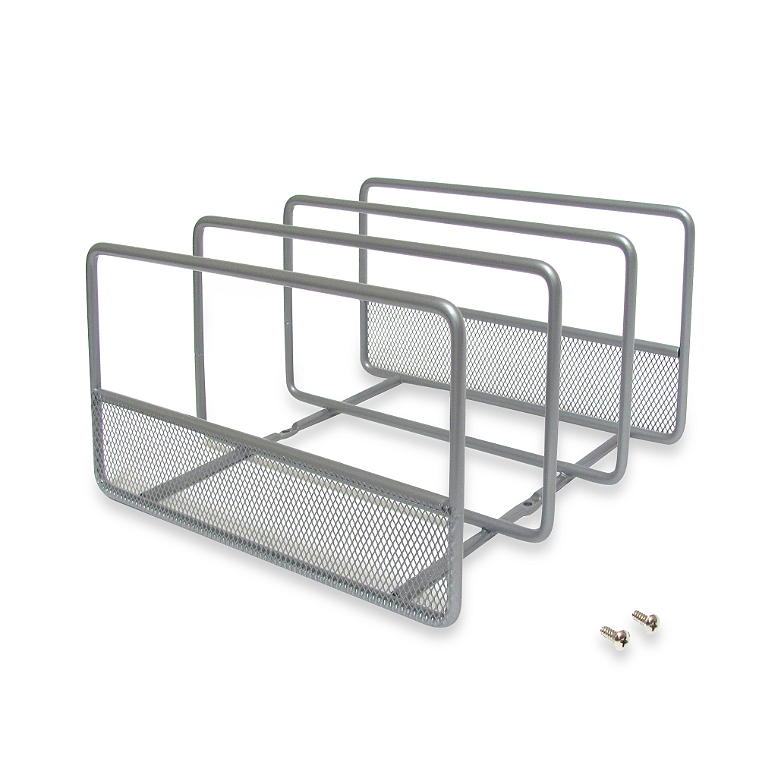 Rev-a-Shelf makes them in two sizes, designed to be used in a 15″ wide or 21″ wide base cabinet. 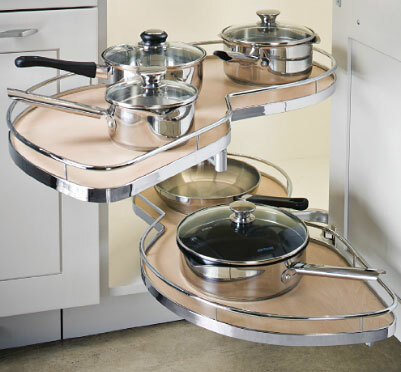 The dividers are all movable so you can customize the configuration to fit the pots and pans you have, and the upper section holds lids at an angle so they don’t have to nest. 7. Trash/recycle pull-out. It’s so nice to have the trash tucked away inside a cabinet if you can fit it into the plan. Pull-out waste containers are very affordable and once you get used to having one… you’ll never want to go back to a dusty ol’ floor model. 8. Lazy susans. There are a lot of choices in this category, from a wire shelf that rotates around a pole, to wooden rotating shelves that attach to fixed shelves inside the cabinet. If it fits in the budget, spend the extra dollars to get the shelf-mounted type… they often have ball-bearing mechanisms that aid in rotation and prevent over-rotation, as well as a raised wood edge or chrome rails. This means there is less wobbling and things don’t go falling off the back if you spin it too enthusiastically. You may also hear the term “super susan”: This just usually means a larger diameter shelf compared with a typical susan diameter. There are newer introductions as well, such as susans with pie-shaped pull-out segments, extra deep shelves, etc. First, lazy susans are not always the ideal solution for every kitchen corner. 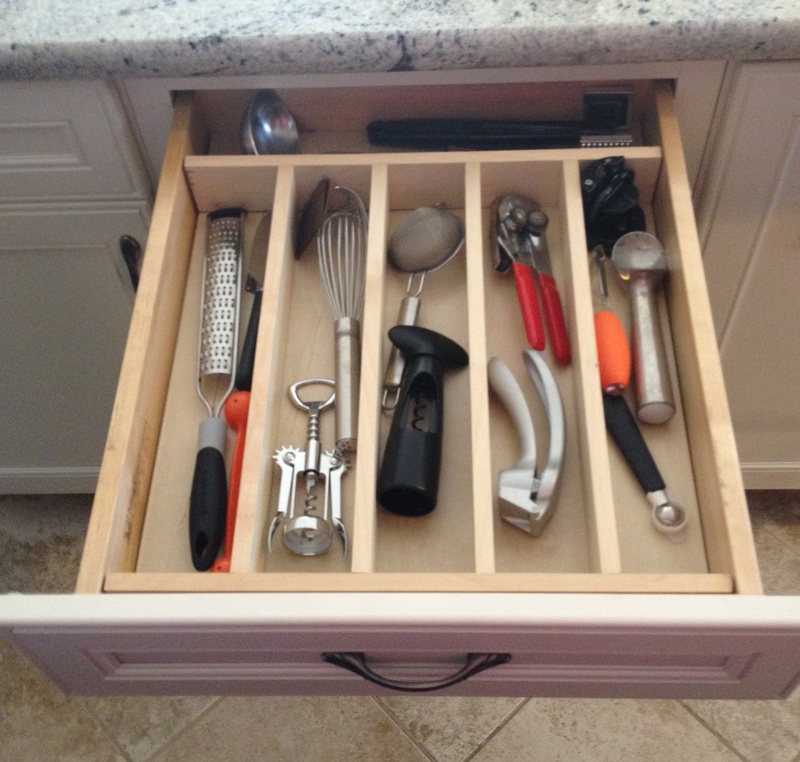 They don’t offer drawer space, and they take room from the cabinetry on both sides of the corner. Sometimes, it’s a better use of space to actually void the corner (meaning it gets boxed in and isn’t accessible) because the benefit of doing so is more than the storage the corner can offer. A good designer will know when to recommend each option. Second, lazy susans aren’t pullouts. So in order to access what is inside the cabinet, you’ll still need to reach inside the cabinet. For those with mobility concerns, this can present a challenge. Third, due to the size of the shelves in relation to the size of the opening, lazy susans cannot be retrofitted. They need to be installed when the cabinet is built. 9. Magic corner / Lemans / Half-moon lazy susan. 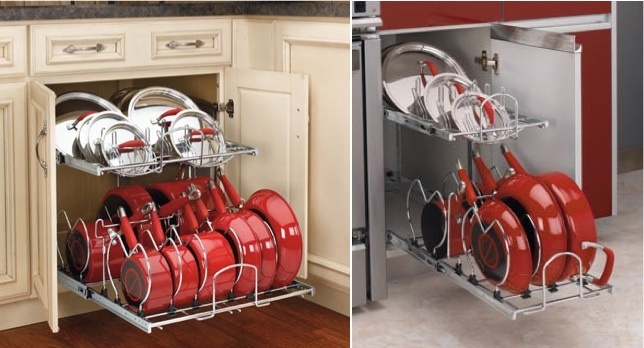 These are accessories that can give you functional corner cabinet storage even if you don’t have wall space on both sides of the corner. 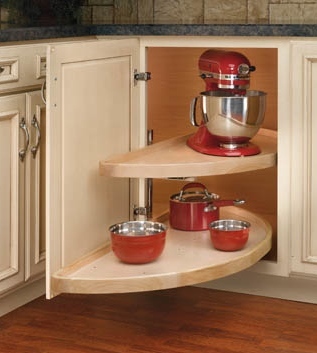 They are designed to fit into blind corner openings and maximize storage space. The Hafele and Kessbohmer units require a higher budget, but the half-moon lazy susan is a good, affordable alternate. 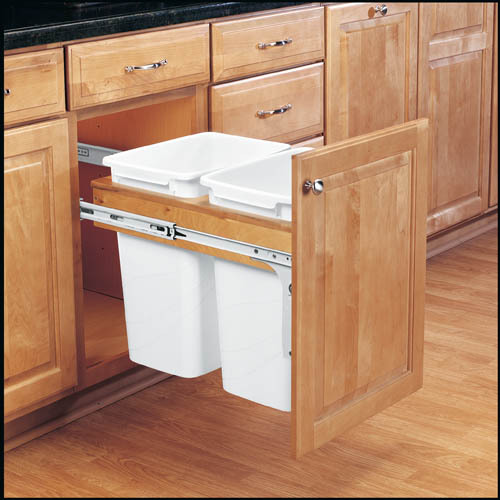 For all blind corner storage options, there are minimum opening requirements, and the hardware will not work if the corner is blocked in any way or located next to a range or farm sink… so, check with your designer. But if the layout allows, these are great blind-corner alternates to a full lazy susan. Magic Corner by Kessebohmer. Photo from Kessebohmer.com. Contrast added. Half-moon lazy susan with slide out feature. Photo from rev-a-shelf.com. 10. Free-standing carousels. These are accessories you can pick up in most stores that sell kitchen tools, and they are great for organizing small things, especially spices! They are also very effective at storing items in large diagonal wall cabinets where it’s easy to lose things. Best of all, they are inexpensive and easy to find, and require no tools. Side note / PSA: those little spice pull-out units that get placed next to the oven are popular, but there are a couple of things to know: first, they raise the temperature of your spices when the oven is in use, second, you have to bend, kneel or squat to access them, and third, spice containers often don’t fit well into them or have to get packed in so you can’t find everything. My recommendation? 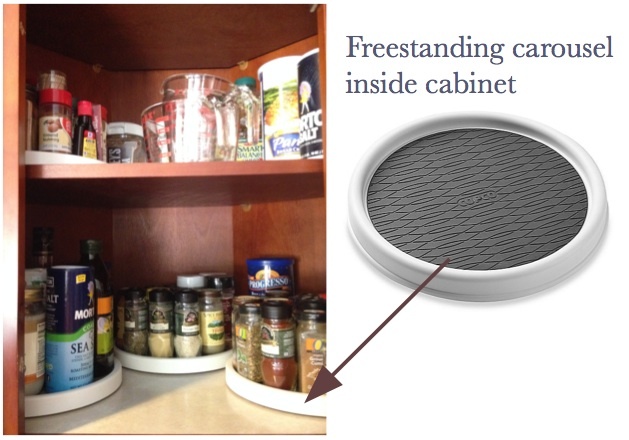 Take advantage of lower cabinet space for the big stuff and keep the spices above the counter! So, that sums up my top ten! Hope you find the list useful as you organize your space. Thanks for the insight into kitchen storage decisions. I have a kitchen remodel in the hopefully near future, and gives me some ideas of what I may need for MY particular size kitchen and storage needs.